This is a post I’ve been meaning to do for a while now but for some reason or another I just never got to it. 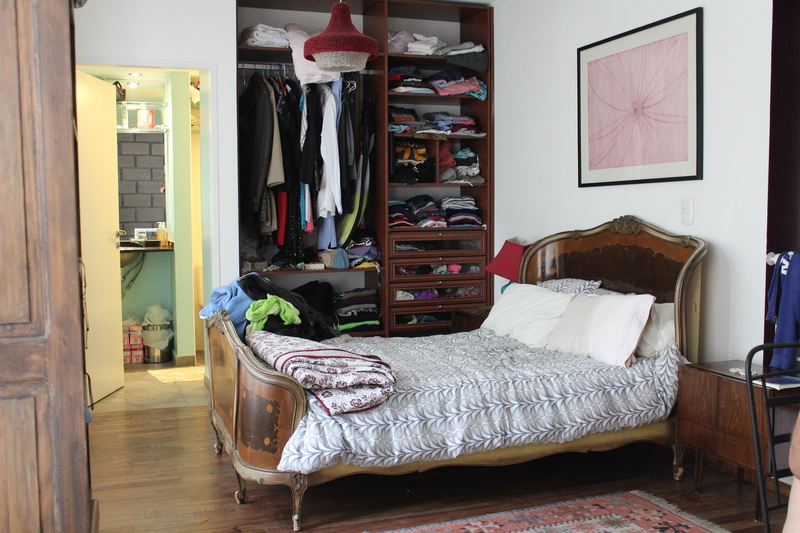 This, FINALLY, is a little tour of our apartment in Palermo Hollywood. Of course we have since moved, but I’ll put this up for posterity’s sake. We lived in the neighborhood of Palermo Hollywood, a up and coming posh place. It’s called Palermo HOLLYWOOD because many of the big shots from Argentine’s flourishing movie industry live(d) in the neighborhood. There are a lot of bars, cafes, and restaurants, but still it seems a little sparse because a lot of it is still being constructed. Sidewalks are unfinished, luxury condo buildings are popping up, and new restaurants or boutique stores are opening all the time. 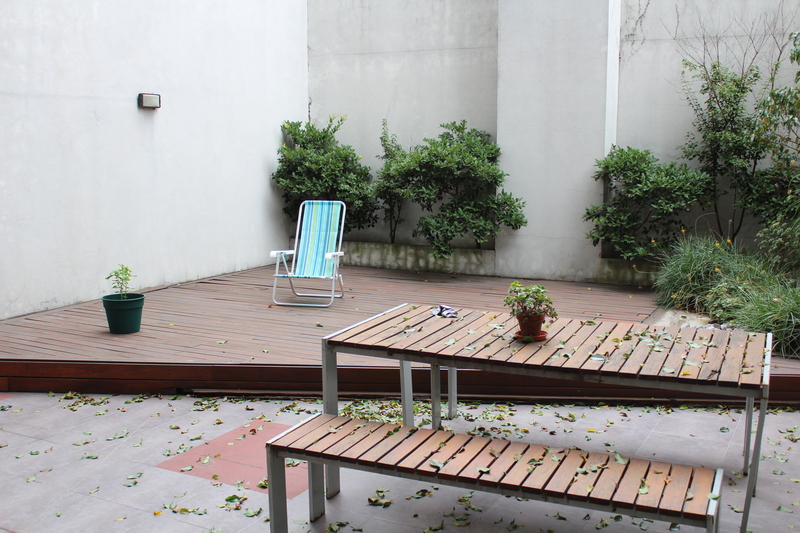 Our place was on the cusp of this neighborhood and the more local Colegiales. 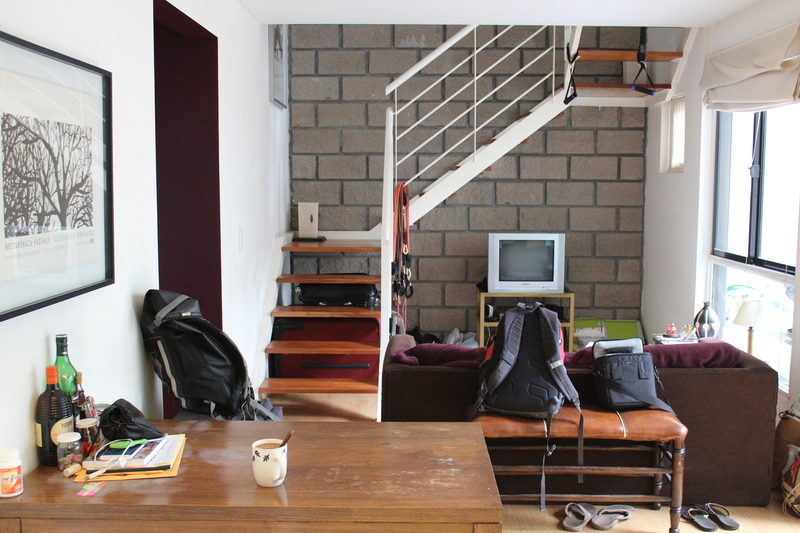 The style of the apartment was the very popular duplex. 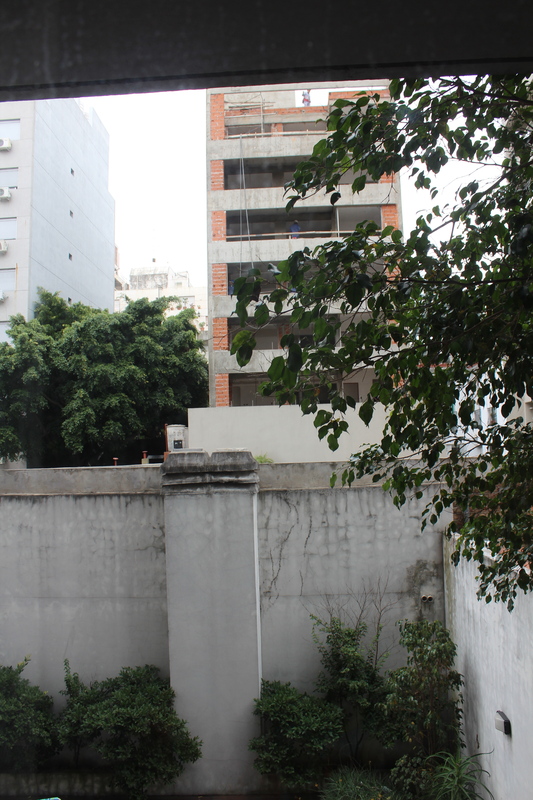 This is very common in a lot of new buildings and when you look to rent a place, 75% of the apartments in the Palermo area will be duplexes where the ground floor has the living space and a half bath and the upstairs has the bedroom and a full bath. When you enter the apartment. The back patio. It was really big and nice. It was a little sparse so we bought a parrilla for it and the chairs and the basil plant. View of the patio from the top floor. 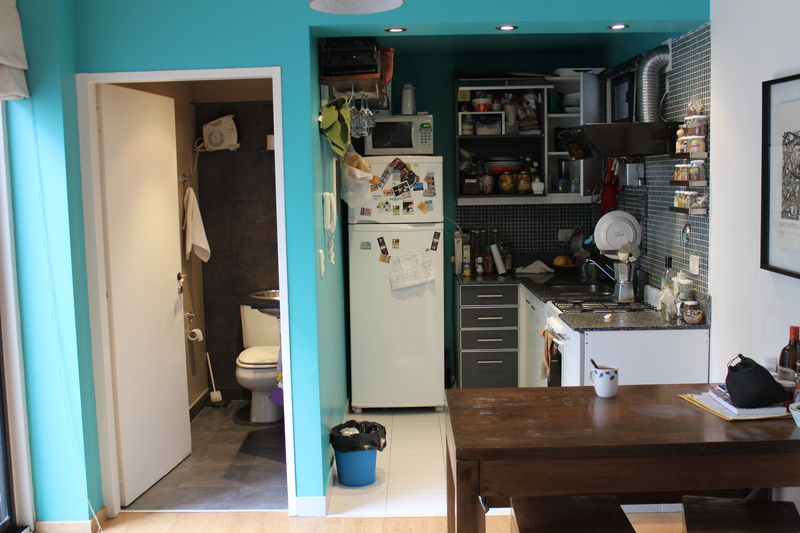 Turning to the right after you enter the apartment is the kitchen and the half bath. Not a lot of counter space, but at least this is open. I love this thing. (I know. Lame.) But it’s really cool. 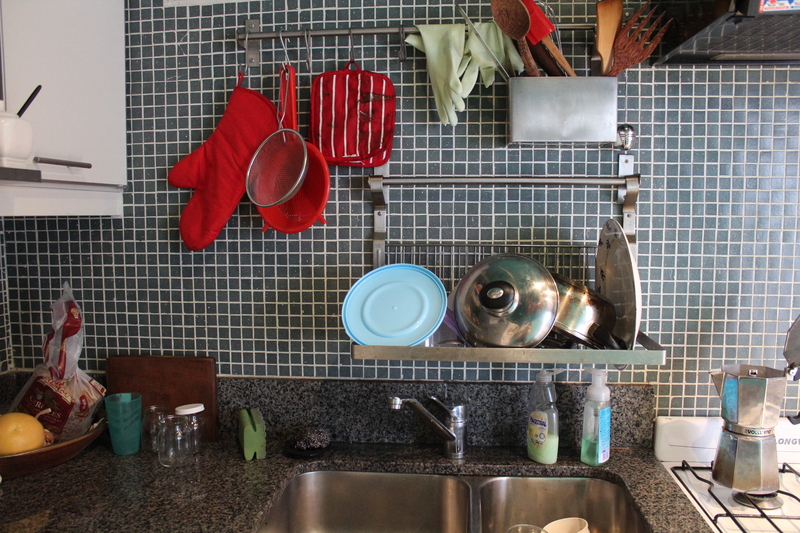 The dish rack hung over the sink with a bar to hang other essentials. When you’re done drying dishes, the bottom part of the rack folds up so you don’t always have it hanging over the sink. Another one of my favorite things about the kitchen. 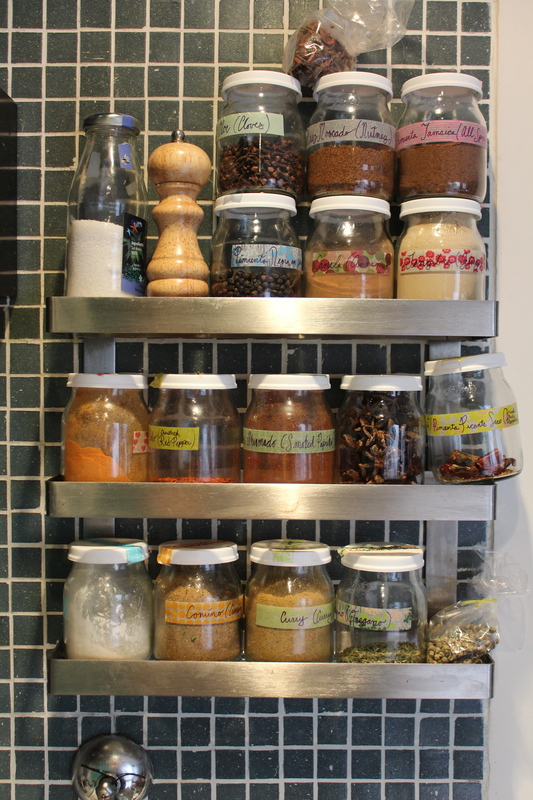 The spice rack is just to the right of the oven. But that’s not it. You buy spices here in baggies in varying amounts. They don’t really have the McCormick bottles of spices. Well some places do but they’re really expensive. So I was able to repurpose these old yogurt containers as spice containers. They hold about 100g of spice, just the perfect amount for your everyday cooking. Standing in the kitchen facing the opposite side of the apartment. Pardon the mess. 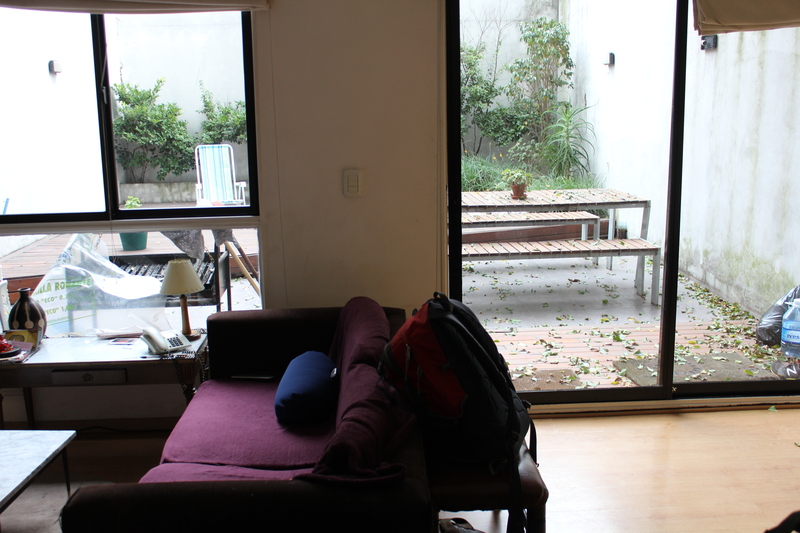 We had just got back from our trip to Mendoza and I was about to start packing when I realized that I never took pictures of the apartment. 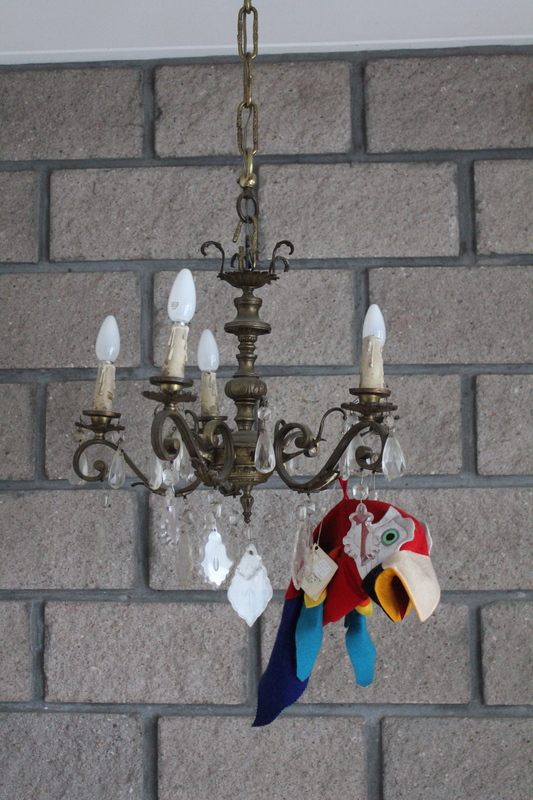 And yes, those are handles hanging from the stairs. Jesse found a good place to do pull ups ha ha. View from the stairs as you enter the bedroom. To the right is Jesse’s desk. 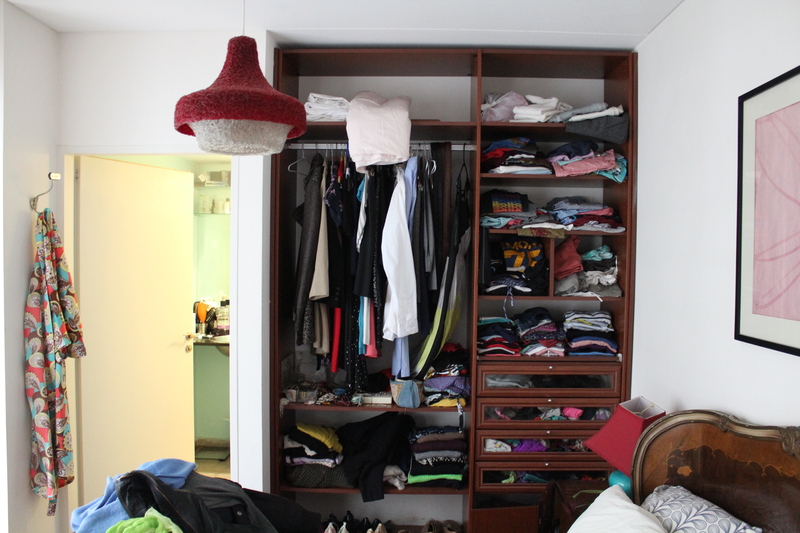 Our “closet” with the bathroom on the left. Jesse’s desk on the left. Poor guy had to sit in that wire chair every day for 6 months. 😦 But it was really convenient that the desk was there. 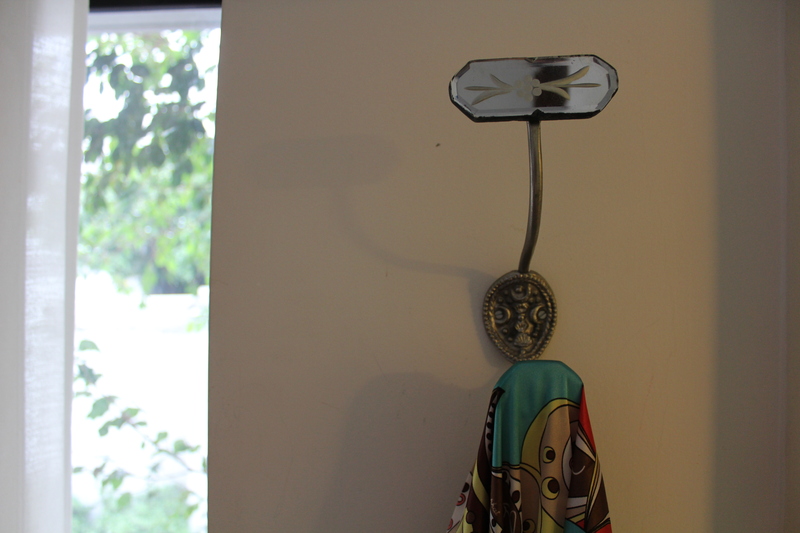 There were a couple little details that were really lovely, like this little robe hanger. The glorious construction that ruined it all. Just behind our building, one of those new luxury condos was being built. Not only did the sounds of hammering and sawing metal wake us up every morning at 730am, 6 out of 7 days of the week, but the construction workers were constantly peering down into our little home. We had to keep the blinds closed all day and I couldn’t go out onto the patio during the day without being hollered at. Between that and some other things that went wrong in the apartment, we finally couldn’t take it anymore and decided we had to get out of there. We actually ended our contract early and found a new place to live. One of the best decisions we’ve made in Buenos Aires. Don’t get me wrong. I’m really glad we spent some time in Palermo Hollywood. It is a really cute little barrio with so many things around it. 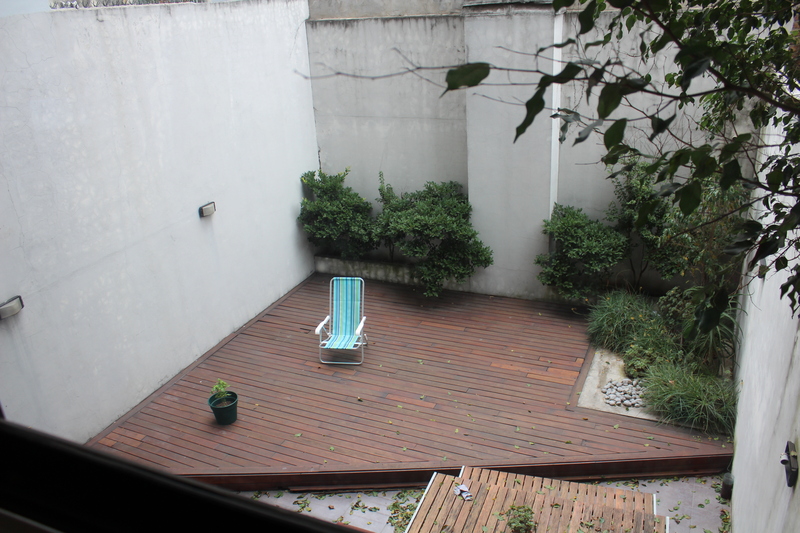 And, as I said, we were also close to Colegiales, las Cañitas – another great neighborhood with lots of shopping, bars, and restaurants, and Belgrano, where Barrio Chino is. I was also able to run to the Bosques de Palermo really easily and get a beautiful run around a couple lakes. All in all, our time in Palermo Hollywood was time well spent. We really enjoyed it and were it not for the construction, it would have been pretty perfect. But now, as you will know if you follow me on facebook or instagram, we have moved on to Villa Crespo and are loving it. 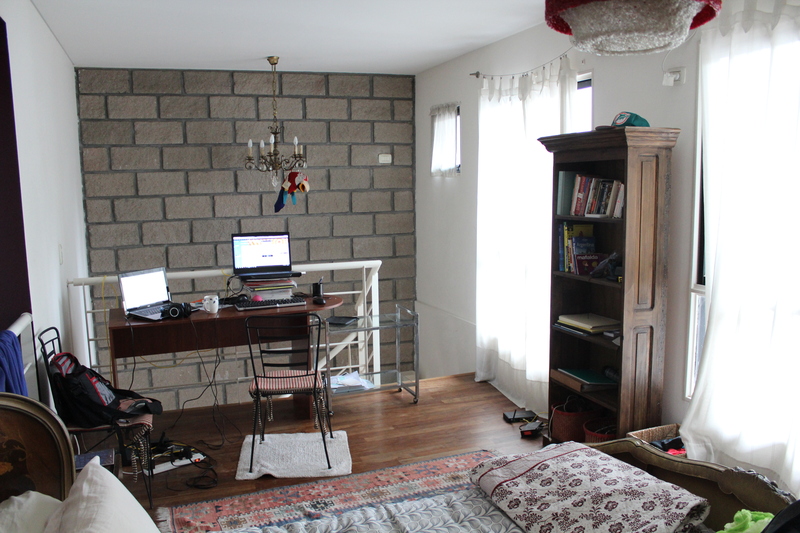 I promise, next week, pictures of our new place. ← Street art is life!